Teyon, one of the most active publishers on the 3DS eShop — and DSiWare previously — has confirmed its latest title for the platform. 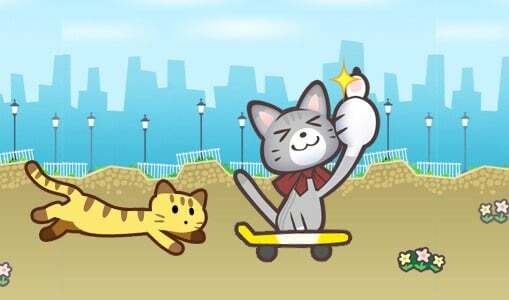 Developed buy FUN UNIT, it'll be a side-scrolling runner called Skater Cat; you can guess a lot from that title. Taking the role of Ollie, you'll take on three worlds and over 25 levels while aiming to collect 90 medals. Beyond that core gameplay there seem to be some promising features — best times and Ghost runs can be exchanged through StreetPass, with developer times being sent via SpotPass. There'll also be an unlockable option to play as your Mii, while Teyon is running a promotion via a dedicated Facebook page where those that give it a 'Like' can receive weekly codes for in-game items and extras. This one arrives soon, too, hitting both North America and Europe on 27th March with a price of $4.99 / €4.99 / £4.49. The trailer is below, so check it out and let us know what you think. I cant say anything bad about this, that cat looks so darn happy I'd almost feel bad if i did! Well...at least it's cute and colourful. I like those in games. Thought of Scram Kitty when I saw the title. Haha. Looks cute. Isn't this Mew Mew Train on the Japanese eShop? It's weird and I never figured out how it really works. Looking forward to the EU release. Not sure if this will be any good. The neko looks cute, though. Yeah, I remember hearing about this being released on the Japanese eShop some time ago. Good to see more games being localized. So, it won't be like OlliOlli?